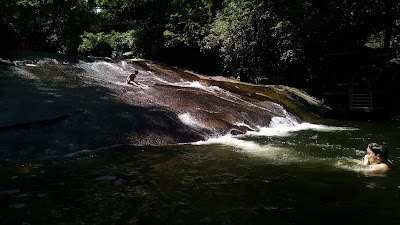 One of my must do's for the trip was visiting western North Carolina and Pisgah National Forest. 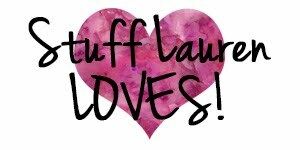 To prepare for the trip to the area I followed local (to the area) and travel blogs (one of my faves is Crazy Family Adventure). They all made Pisgah look amazing. Not far away is the city of Asheville, NC. 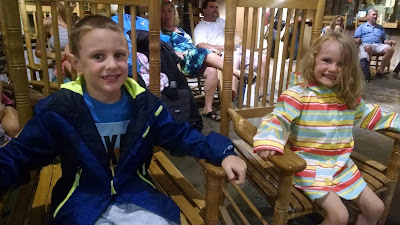 We decided on a day trip from Gatlinburg to Asheville then to Pisgah National Forest. We woke up early on travel day, ate breakfast, threw on our swimming suites with hiking clothes over, and got on the road to North Carolina. It was about a 2 1/2 hour drive, with a stop at an information center. I was really happy the kids needed to pee because we got some very useful information from the ladies working at the center. I had originally wanted to make a stop at the Biltmore Estate but realized that it would have taken too much time. Also, our GPS had us going to the northern part of Pisgah National Forest rather than south of Asheville. I'm so happy we avoided that disaster! 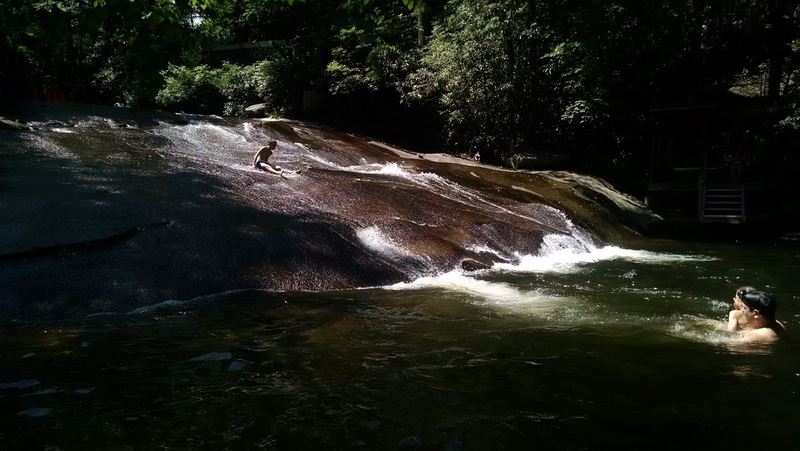 * Insider's tip: Pisgah National Forest is actually split up into three different sections, with Asheville in the middle. All of the waterfalls such as Sliding Rock and Turtle Falls are in the Southern portion. We walked out of our cabin only to be greeted by the muggiest day we've ever experienced. 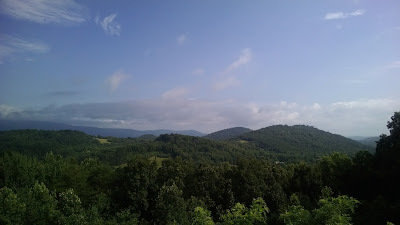 I was happy to be leaving the mountain for NC, where the humidity was slightly less (maybe 5% less, literally not much). I had to take some pictures of our steep driveway from the cabin. As soon as we pulled onto the road from our driveway, we were treated to a view of Mt. LeConte. More magnificent views on our drive to Asheville. We arrived in downtown Asheville around 10 a.m. Asheville has a buzzing art scene. 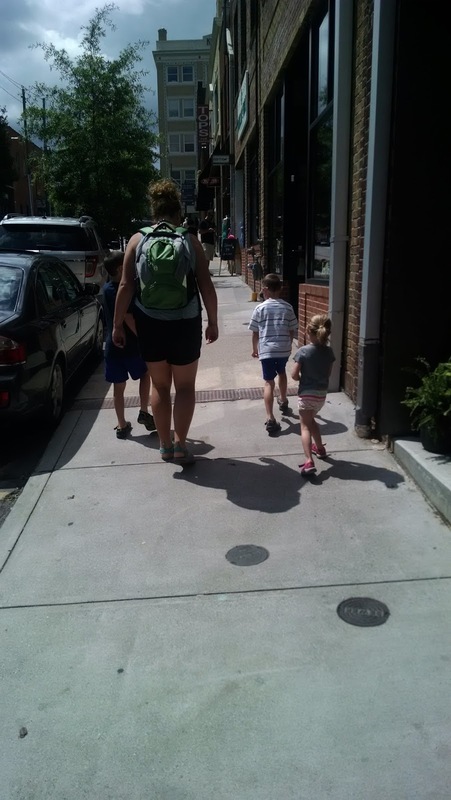 One of the first things we did was tour the Asheville Urban Trail, a 1.7 mile through downtown Asheville with public sculptures throughout the walk. We actually just happened to park next to one of the sculptures on the street, but eventually we made our way to the beginning at Pack Place. We didn't walk the entire Urban Trail, but we loved the vibe from downtown Asheville. However, if we ever go back, I'll wait until the minis are older or we do a trip without kids. There's also a lot of fun breweries in the Asheville area. Hubs and I would LOVE to do a brewery tour someday. I kept the hiking backpack with me at all times during our trip. I fell in love with it actually. Not only could it carry everything we needed for an entire day out, but the thick padded straps and supports across the chest and stomach made this pack a breeze to carry. I had zero back and shoulder pain, even after carrying the pack around for days. Our first stop in Asheville was a chocolate lounge. The kids got creamy gelato (perfect for the hot day) and Hubs and I split a chocolate creme brulee, which ultimately became the mini's. A break to do a pony tail and caught Max cleaning his sunglasses. I had no idea this picture existed until I started going through pictures of the trip. The beginning of the Urban Trail had fountains to play in. The minis took full advantage. Elizabeth does not like spraying water. She stayed back while the boys soaked themselves. Bowling balls were the decoration on this rock wall. The minis thought this was "so cool!" 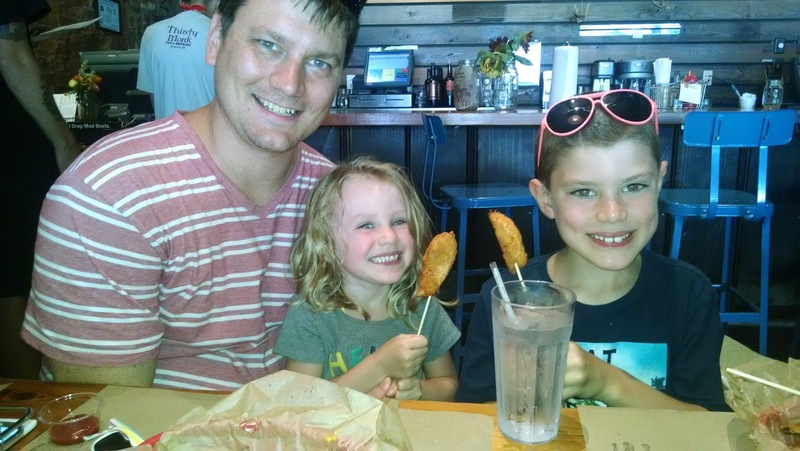 Asheville has a ton of fantastic restaurants! There was a Caribbean/Mexican (called Salsa's...yes, I'm still upset we didn't get to eat at this restaurant) infused restaurant that sounded phenomenal and tons of organic restaurants. Ultimately we wound up at Farm Boys for lunch - a burger place with a farm to table, organic concept. The minis got chicken on a stick and Hubs and I got burgers and fries. It wasn't anything special but the minis did eat well. After lunch we made our way to Pisgah National Forest. I will be the first admit that the drive took longer than I expected. 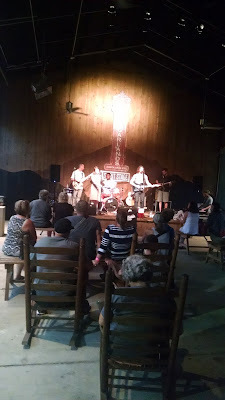 All of the blog posts I read about going to Pisgah made it sound like it was an easy drive just outside of Asheville. Well it is an easy drive and it is outside of Asheville, but not as close as I initially thought. By the time we got to the Forest, Hubs and I were the only ones willing to get out and pose in front of the sign. 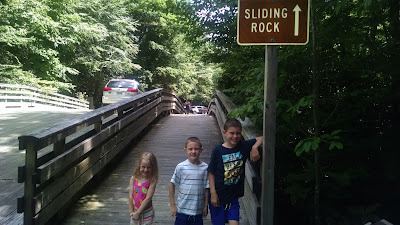 Our main point of interest in Pisgah was a waterfall you could slide down, otherwise known as Sliding Rock. 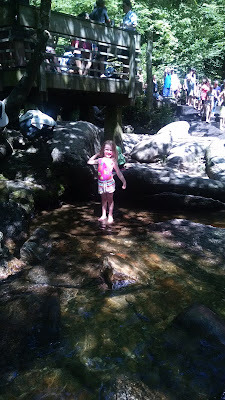 There's actually a few waterfalls you can slide down in the Forest but only one we could safely do with young kids. The great thing about Sliding Rock is that it's still a very natural setting, but with life guards all around (only during the in-season, which I believe is Memorial Day to Labor Day). Things are actually very organized in Pisgah. 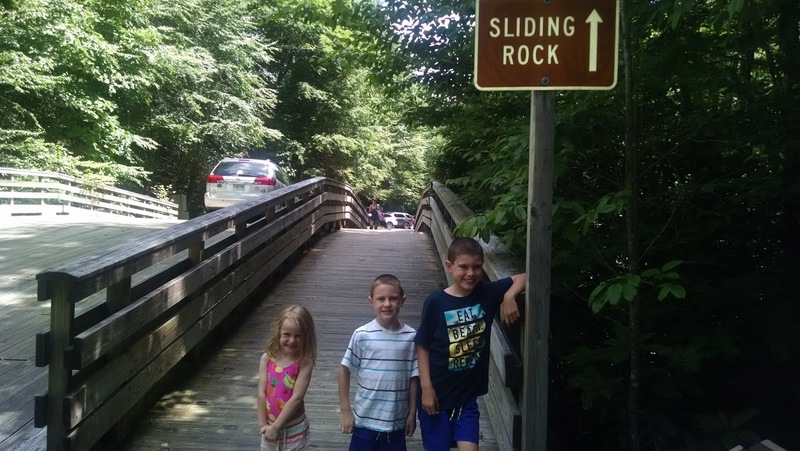 The cost to go down Sliding Rock is $2 per person, per day. You pay at a booth on your drive into the parking lot. I get the feeling that a lot of locals use Sliding Rock as we use public swimming pools. I totally would too if I lived in the area. There was the deeper water (not that deep, maybe around 7 ft. at the deepest point, which quickly becomes shallow) for the rock slide. Then an almost pool of shallow water, which families were using for babies and toddlers as a wading pool. The water was COLD but felt good on the extremely hot day (high 90's). Elizabeth could never work up the courage to go down with one of us. Harrison went down twice; once with Hubs and once with me. Max went down numerous times (no shocker there). While the line to go down was long, the line moved quickly. To see footage of our slides down, see Vacation Videos here. Shorts and shoes are a good idea for any waterfall slide in the Forest (as we've heard and now experienced). While the rocks are extremely smooth from years of water flow, it's still a rock. I can imagine that if you do this a few dozen times, you may wind up with some scrapes on your thighs. Shorts are a good idea for some extra coverage, although a lot of people just had on swimming suites. Footwear is also a good idea. 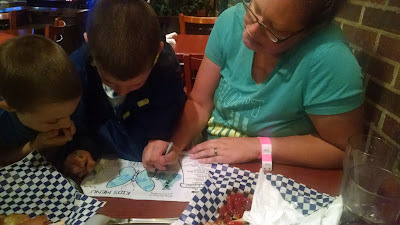 Hubs and I wore our Keens (the boys went barefoot so they weren't dragged down by the weight of their wet shoes). The Keens came in handy for walking on the bottom after sliding. There was so much more we could have done in Pisgah National Forest if time allowed (including so many hikes and Looking Glass Falls). 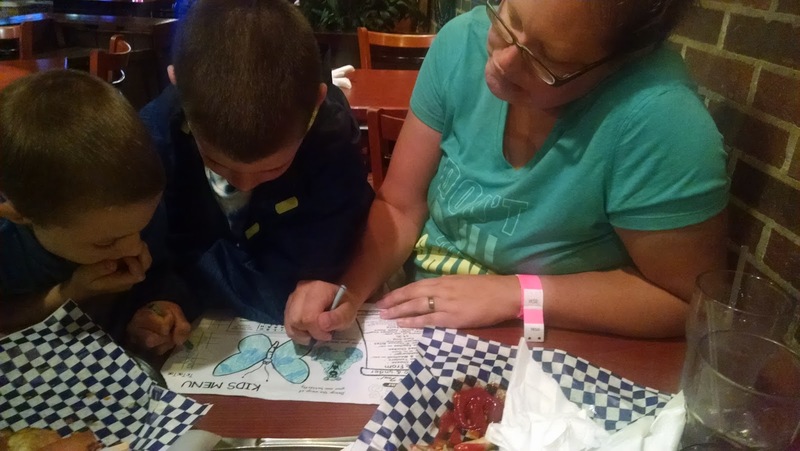 But, we wanted to get back to Gatlinburg to tour the moonshine distilleries since we had skipped them the night before and went to Cades Coves instead (read about that adventure here). So, we left Pisgah with the saying "next time we're here, we'll spend a couple of days exploring the Forest." That's how gorgeous and family friendly the area was. We left North Carolina and gorgeous blue skies as we traveled back to Tennessee. 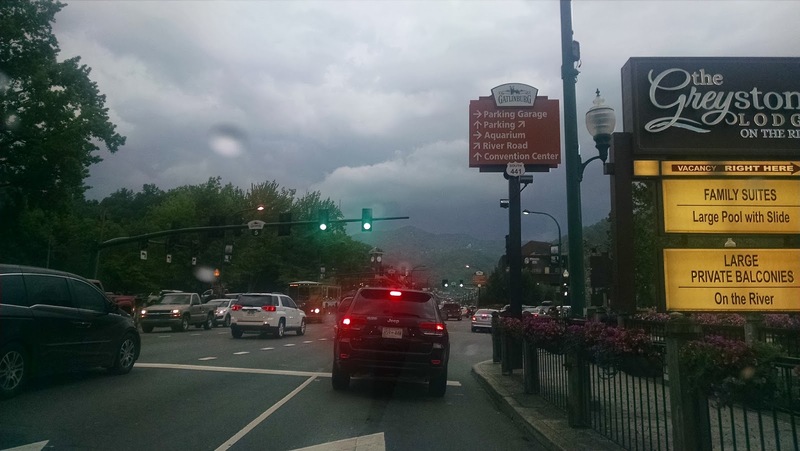 Just as we got into Gatlinburg, a storm moved over the mountain. If you've never witnessed a storm coming over a mountain top, put it on your bucket list. It's heart stopping amazement and fear all at once. The lightning was fierce, the thunder close, and the rain felt incredibly warm. I was very happy that I packed rain jackets for us all. We were able to walk around all of downtown Gatlinburg without getting soaked. We managed to make it to Sugarland Distillery, where we bought more than enough Moonshine and listened (and danced a bit too) to a band. We knew we wouldn't be able to drag the minis to another distillery without dinner or there would be scary meltdowns. We went to a restaurant called Blaine's. It was nothing special, but it had decent prices and food the minis would eat so I can't complain. 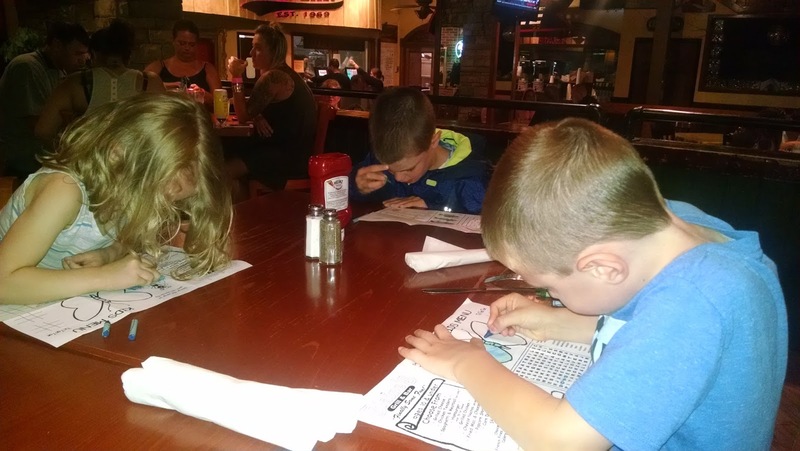 We had some moments of silence and resting with coloring and playing Tic Tac Toe. Then it was on to Ole Smoky Distillery. This was a bit more family friendly compared to Sugarland. The kids got to sit in rocking chairs and listen to a band play (who played Garth Brooks and had everyone up and dancing at one point) while Hubs and I did a tasting with a bartender (all with the minis just a few feet away). We never did an actual tour of the making of moonshine because I was worried the minis would get bored. We were just happy with the tasting and buying part! The only thing I wish was different about this day was not having as much time in Pisgah. 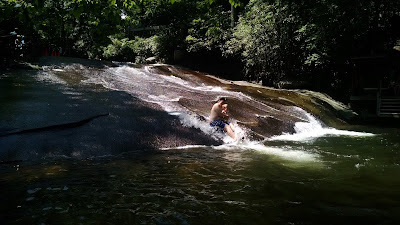 Next time around we'll probably skip Asheville all together (unless it's an adults only trip), rent a cabin or resort for a night, and spend two full days sliding down waterfalls. Otherwise, it was a very memorable day! The minis are now obsessed with waterfalls. Elizabeth reported during dinner that she would like to spend her 5th birthday hiking behind a waterfall again. When you can end a day with a sense of accomplishment, wonder, and sense of how great nature is, I'd call it a successful day. Read about our other fun adventures this trip: Summer Road Trip To Tennessee, 4th of July in Tennessee, and Our White Water Rafting Adventure. The adventure continues tomorrow with our drive to Louisville (a little less than fun) and our time in Louisville, KY.